Lightweighting is a priority in the automotive sector but now the railroad industry is also thinking more seriously about weight reduction programs for diesel trains in order to reduce fuel consumption, costs and carbon dioxide emissions. 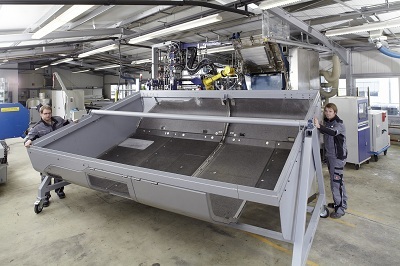 At the 2012 JEC trade fair, Bayer MaterialScience (Leverkusen, Germany) presented a newly developed sandwich material based on the Baypreg polyurethane spray system that is well suited for diesel engine enclosures. The finished component is 35 percent lighter and 30 percent less expensive than its steel-and-aluminum counterpart. The enclosure is located beneath the train’s passenger compartment and above the tracks. Because it has to protect the engine from rock impacts, the it must be able to withstand high mechanical loads. The chemical resistance requirements are also exacting, as the component should also be able to prevent oil from leaking onto the track bed. The greatest challenge, however, is compliance with the strict fire protection requirements according to the European standard CEN/TS 45545. The composite material featuring the polyurethane spray system easily meets all of the requirements mentioned above. Most sandwich constructions currently used in lightweight construction are based on glass fiber-reinforced structures with a rigid foam core. The components are produced in a complex process using conventional epoxy or polyester resins. Under the new concept, the parts are manufactured directly in their complex, three-dimensional shape using a spray/press process. Components with a maximum area of up to four square meters are possible – a record for this manufacturing process. Despite the large part dimensions, the excellent dimensional stability afforded by the process enables the parts to be precisely installed in the final assembly. Additional functions and elements can be easily integrated, significantly reducing the number of parts in each assembly. The sandwich structure is based on a honeycomb core covered on the top and bottom with glass fiber mats. It is sprayed from both sides with the Baypreg system, which contains the flame retardant and, optionally, cut glass fibers. The still moist composite is placed in a mold, where it is pressed at a temperature of 130°C. The polyurethane system reacts and foams slightly, binding the components together firmly and permanently. The part can be removed from the mold after just two minutes or so and deburred. Coating is the last step. Alternatively, surface coating technologies such as in-mold coating or variants with polycarbonate films, for example, could also be used. The PURTrain project under which the technology was developed is a feasibility study for enclosing the diesel engines of the Itino train. Financing was provided by the German Federal Ministry for Education and Research (BMBF). Bayer MaterialScience collaborated closely with Bombardier (Montréal, Canada), KraussMaffei Kunststofftechnik (Munich, Germany), DECS GmbH (Thuringia, Germany) and the DLR Institute of Vehicle Concepts (Stuttgart, Germany) on the project. Other project participants included the Fraunhofer Institute for Chemical Technology (Pfinztal, Germany), the University of Stuttgart and Karlsruhe Institute of Technology.